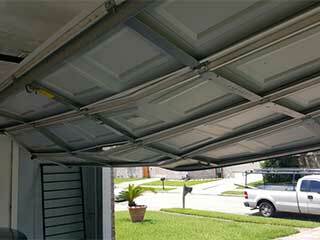 Our team provides professional garage door maintenance services to local Diamond Bar residents. We have a highly skilled team of expert technicians who can undertake different tasks – from spring adjustment to sensor realignment and more. It is in the best interests of every homeowner to have their property maintain on a regular basis. An occasional inspection can go a long way in ensuring that your door keeps working properly. If during these inspections we were to discover an issue, we'll treat it right then and there, thus effectively preventing major problems from developing. This scenario is often caused due to misalignment of the photo-electric eye sensors located at the bottom of your garage's opening. They are in charge of preventing the door from closing on an obstacle. If their alignment is not exact, they can mistakenly "see" something blocking your door's path, when nothing is actually under it. This can cause your system to reverse each time you try to close it. On the opposite end of this situation, we have a case where the sensors are misaligned but the door has no trouble closing. Needless to say, this type of scenario is incredibly dangerous. Our technicians will check the condition of these crucial components and carefully realign them as necessary. Another key focus of our maintenance routine is checking the springs and the cables to make sure their condition is still optimal. These components support the weight of your door while it's moving, and therefore this part is very important. We'll also lubricate them, as well as the rollers and the hinges of your door, to keep their performance smooth. Doing this is more than simply checking a box. By making sure these components are serviced on a regular basis, you'll be able to avoid a lot of potential damages and accidents. By keeping your overhead door in a good working condition, our technician can effectively increase their working lifespan by several years. Contact our experts at Garage Door Repair Diamond Bar to schedule an appointment today.